This cozy, RECENTLY REMODELED, fully-furnished, knotty pine/beam ceiling chalet, has 3 Bedrooms (1 King, 1 Queen, 1 Queen) + Loft (1 Queen), 2 Full baths, and sleeps up to 8 (no sofa sleepers). Located in prestigious Montgomery Estates, it has open space behind and on the side, providing quiet surroundings and views of the Sierras. It's just a short walk to the forest with great walking trails, and only 3 miles to Heavenly, 2 miles to the lake, and 5 miles to the casinos. Great location + Great rates makes for the best vacation experience you can have at Lake Tahoe. Portable crib, iron & board, patio furniture & umbrella. Hi-Speed Cable/WiFi Internet access. Disc golf & skateboard park, Ice skating rink, Public Pool and Recreation Center: short drive, 0-5 miles. Large wood-burning Rock Fireplace and HDTV, DVD/VCR and CD player,recliner sofa. 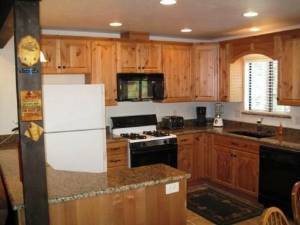 Newly remodeled chalet with granite rock accent and 2-car garage with key-less opener. 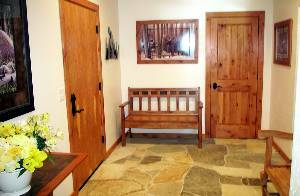 Granite floor entryway with closet and seating for your convenience. The newly-remodeled kitchen is fully-furnished for all of your cooking needs. 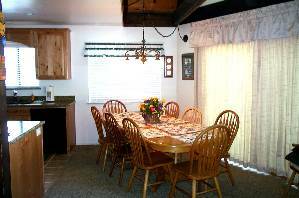 The large Oak Dining Table and Chairs provide seating for up to 8 guests. 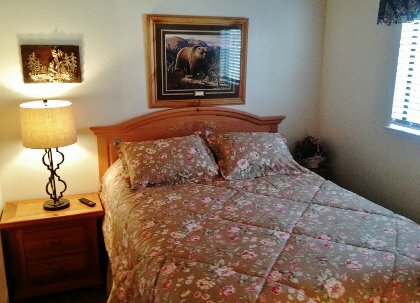 This downstairs bedroom has a King-size bed, phone and cable HDTV with remote. This downstairs bedroom has a Queen-size bed and cable HDTV with remote. 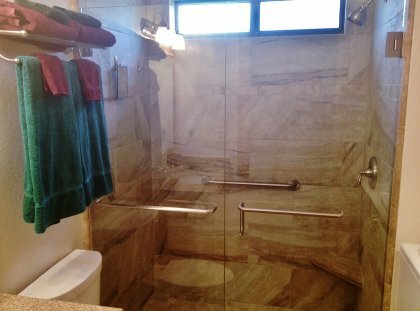 Remodeled bath with large tile shower, elevated toilet and heated tile floor. My group of friends came up here for a 3 day, 2 night trip, and the location worked out perfectly for those who wanted to go to Heavenly Ski Resort (literally minutes away), Sierra-at-Tahoe (less than 12 minutes drive), or just go for a drive around the Tahoe Lake area. This cabin housed and slept 9 people VERY comfortably with the spacious rooms and general layout of the interior, and the kitchen is supplied with all sort of utensils for most cabin trip cooking needs. The cabin had special instructions for keeping the heater above a certain level, so please follow them to avoid needless troubles. I also want to mention a special thanks to the owners for being so courteous and supportive of our stay at their cabin (and post visit). Thanks again for having us, and we will definitely consider this cabin as a priority next season! 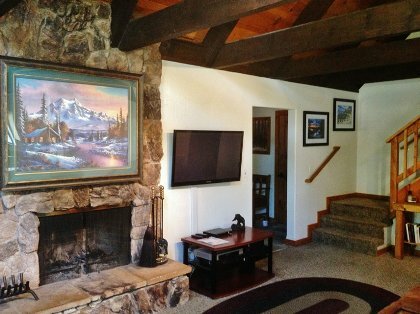 November 12, 2011 Reviewer: Sharon H.
My son got married in So.Lake Tahoe and he found a home on the HomeAway site for the wedding party, but we needed additional space for more of the family so I found this home just a couple miles away. It was so much easier - and less expensive - than renting hotel rooms in town. The owners were so responsive to my request, the home was in perfect condition and we enjoyed the wedding much more with such a great place to stay. 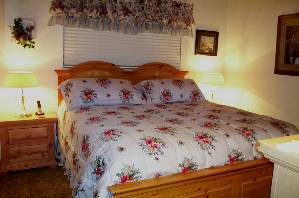 I highly recommend this site and this home when looking for places to stay. We have stayed 3 times at the Tahoe Mountain Property. I would highly recommend it to anyone. Heidi and Dan our great and the location is perfect! November 12, 2011 Reviewer: Andy M.
My family has been renting homes in South Lake Tahoe for over 10 years and we just returned from our third visit to this home. It's a wonderful property and we view it as a our home away from home. The neighborhood is in a convenient location, it's quiet, and the neighbors are very friendly. The house is in excellent condition and contains everything needed for a family vacation (cable TV, modern appliances, two showers, comfortable beds, etc). It's very clean, sleeps a good amount of people, and the bunk beds downstairs next to the master bedroom are great for families. The owners were very easy to work with and very responsive to our needs and questions. 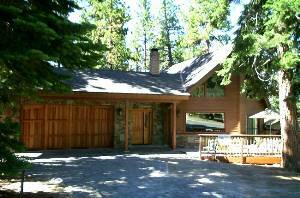 I highly recommend this property to anyone looking to get away in South Lake Tahoe. $125 cleaning fee. 10% occupancy tax on rental fee + cleaning fee. Deposit: $350 refundable security deposit. Failure to comply with rental agreement will result in forfeiture of Security Deposit! Cancellations and Refunds: $25 cancellation fee. Required Stay: 2 to 4 Night Min.